Following on from my "Armchair Tour of Britain's White Horses" in my last blog post, I have again used the power of Google Maps to explore some of the other (non-equine) hill figures that can be found dotted around our countryside. The hill figures found below are listed by approximate age, with the oldest first. The Cerne Abbas Giant is perhaps the most famous of all British hill figures, possibly because he sports a rather large erection! The giant (and his protruding member) can be found north-east of the village of Cerne Abbas carved into the side of Giant Hill (which is also known as Trendle Hill). Although most people assume that the giant is ancient, there is little firm evidence to provide an accurate estimation of the construction date of the giant. The earliest known documentary evidence mentioning the giant is said to date from the late 1600's. The giant stands 55 m high by 51 m wide and some archaeological work suggests that the giant once had a cloak, net or animal skin draped over his outstretched left arm, a feature that has been lost over time. The Wilmington Long Man is a very well-known hill figure that can be found to the south of the village of Wilmington and to the south-east of the village of Milton Street (just north of the South Downs Way). 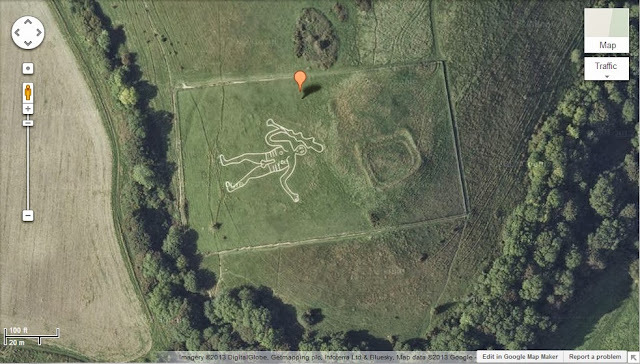 The Wilmington Long Man is cut into the steep slopes of Windover Hill and is measured at 69 m tall. He cuts a distinctive figure because he holds a long “pole” in each hand. The Wilmington Long Man has over the years been known by a number of different names, and is sometimes referred to as the Wilmington Giant, or as the Green Man. It is believed that the Long Man was at some point during his life only present as an indentation in the grass and hence he was labeled as the Green Man. The creation date of the Long Man is unknown. It seems that for a long while he was believed to have dated from the Iron Age or Neolithic period, but now there is some evidence to suggest that he may be a much more modern creation, perhaps dating from the 16th or 17th Century. 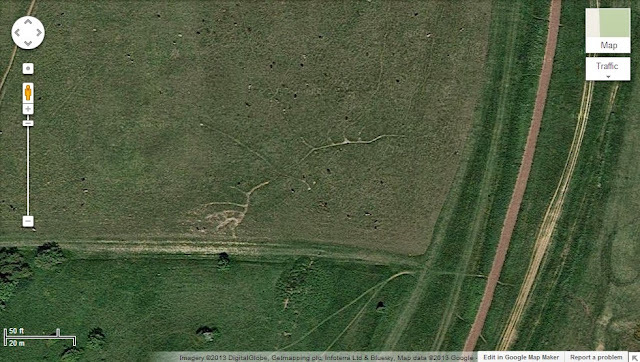 It seems that the earliest piece of documentary evidence depicting the Long Man dates from around 1710. 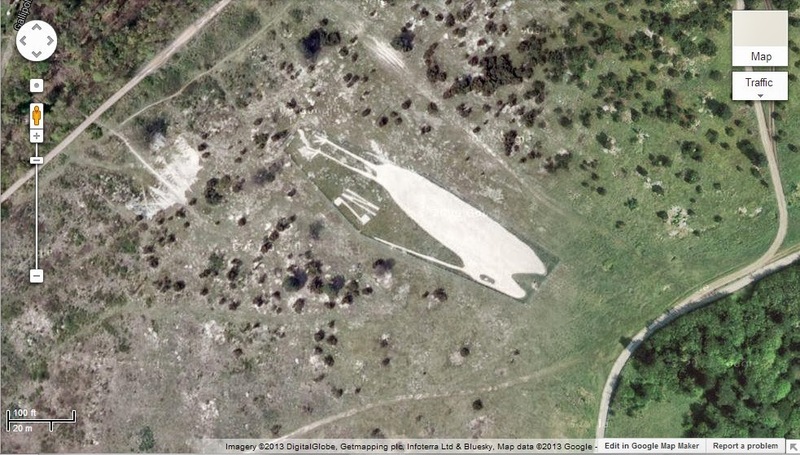 During World War II the Wilmington Long Man was disguised to prevent him aiding German Pilots, this was achieved by painting him green. 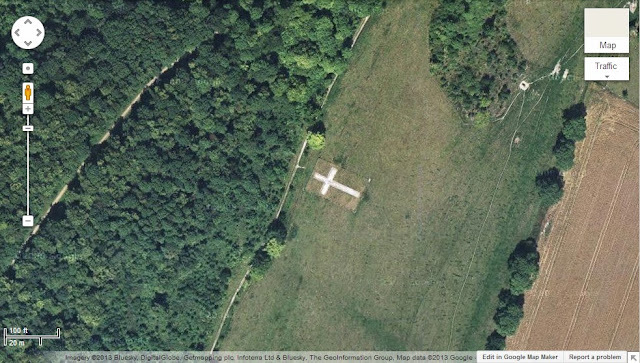 The Whiteleaf Cross is a chalk carving comprising of a large triangular base with a cross perched on the pinnacle. The Whiteleaf Cross can be found to the north-east of Princes Risborough, and just to the side of Peters Lane. The precise date and origin of the cross are not known and there seem to be a number of theories as to what the cross is supposed to represent or commemorate. The earliest documented mention of the cross is reportedly from 1742, but how long the cross had been in existence prior to this mention seems to be unknown. The Watlington White Mark lies south-east of the village of Watlington, just to the south-east of where Hill Road intersects The Ridgeway. The white mark was apparently designed by a local man who one day decided that the local church (when viewed from his home) would look more impressive if it had a spire! So in 1764 to provide the church with a spire he cut the white mark into Watlington Hill. 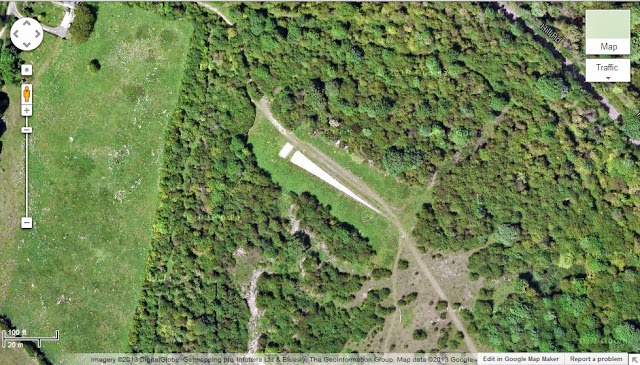 The Watlington White Mark is measured at 11 m wide (at the base) and 82 m in length. 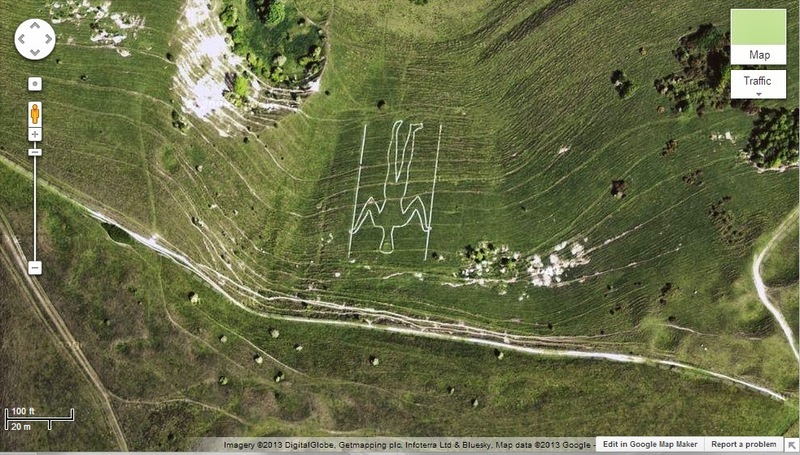 The Strichen Stag is a hill figure that has been created from local white quartz rocks (as opposed to the more typical chalk constructions). The stag lives north-east of the village of Strichen, on Mormond Hill, and can be found to the east of the Strichen White Horse. Interestingly even though the stag is only a couple of miles from the white horse, there seems to be a band of gray on Google Maps (presumably cloud) that makes the stag hard to see. But it's head can just be made out by a keen eye. The Strichen Stag was constructed in 1870 and is larger than the Strichen White Horse, measuring around 73 m in length. The Wye Crown lies on the Downs to the east of the village of Wye (to the north-east of Coldharbour Lane). This crown is believed to have been carved in 1902 to commemorate the coronation of Edward VII. Perhaps the most unusual of the chalk figures included in this post, The Compton Chamberlayne “Australia” is an outline map of Australia marked into the Wiltshire countryside. 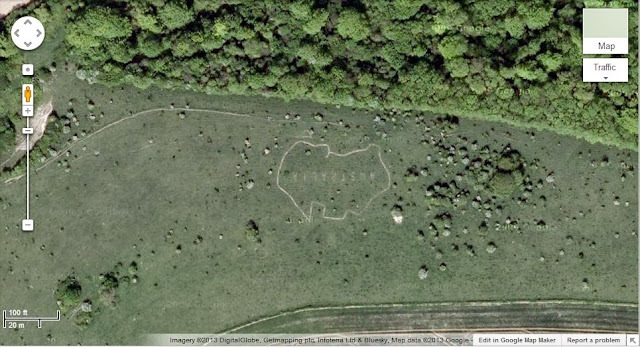 This chalk map can be found south-east of the village of Compton Chamberlayne, and only a short distance from the nearby Fovant Badges. Presumably the carving dates from around World War I, when there were thousands of Australian and Canadian troops encamped in the vicinity awaiting transport to the war in France. The local graveyard in Compton Chamberlayne contains the graves of around 20 Australian soldiers who are believed to have died of influenza while awaiting transportation to France. 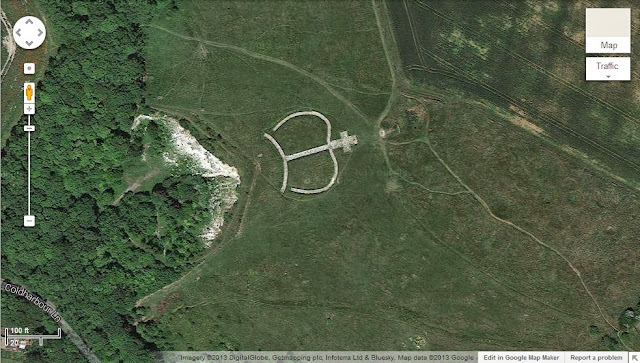 The Bulford Kiwi can be found just east of Gallipoli Road in the town of Bulford. The Kiwi is carved into Beacon Hill which overlooks the town, and is very hard to discern from the road as you drive through the town. The Kiwi was created by soldiers from New Zealand whilst they were awaiting repatriation after the end of World War I. The Kiwi was cut in early 1919 by the Canterbury and Otago Engineers Battalions, and it seems that the creation of the Kiwi may have been used as a way to keep the troops busy whilst they awaited the trip home. The Kiwi is a large carving and covers approximately 1.5 acres. On the A30 near to the village of Compton Chamberlayne and south-east of the village of Fovant, a series of chalk military badges can be found which are known as The Fovant Badges. Similarly to the Compton Chamberlayne “Australia”, The Fovant Badges were initially created by soldiers who were stationed in the area waiting to go to France in 1916 to fight in World War I, and further badges were added over time. At one point there were twenty badges, but today only eight of these originals remain (plus a ninth, crudely cut YMCA badge). The Lamb Down Badge is located east of the village of Codford and to the north of the A36. The badge is the emblem of the Australian Commonwealth Military Forces and is known as the “Rising Sun Badge”. The badge was cut in 1916/1917 by Australian troops who were based in the area. The badge measures approximately 175 ft by 150 ft. 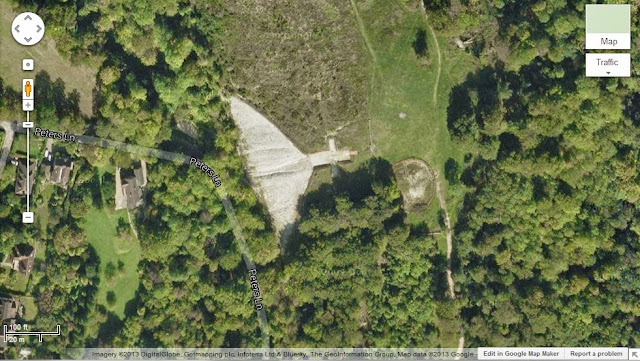 The Shoreham Memorial Cross can be found north-west of Shoreham (Kent) on the edge of Meenfield Wood. 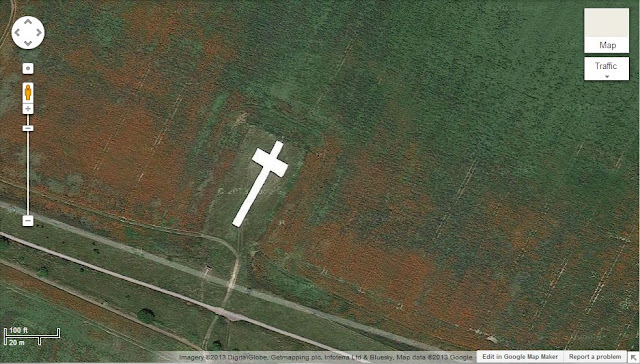 The chalk cross was constructed in 1920 and was designed as a memorial to local men who died during World War I. The Lenham Memorial Cross can be found to the north-east of the village of Lenham, carved into the slope of the North Downs (near The Pilgrim’s Way/North Downs Way). As its name suggests the cross is a war memorial, which was constructed in 1922 to originally commemorate those who died in World War I. The cross is approximately 200 ft across and was apparently filled in during World War II, to prevent it being used as a navigational aid by attacking German aircraft. 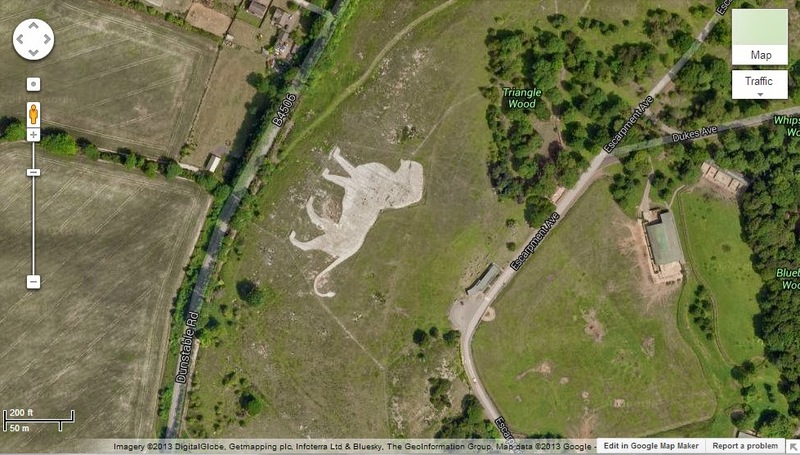 The Whipsnade White Lion lives just to the west of Whipsnade wildlife park, between Dunstable Road (B4506) and Escarpment Avenue. The lion is a large beast, measuring in at around 500 ft in length. The lion was constructed in 1933, and like many other chalk figures it was covered during WWII to prevent it being of use to German pilots. The Brighton White Hawk can be found in the Whitehawk area of Brighton, to the east of town, and just east of the Whitehawk football ground. The White Hawk, which is now rather faded, can be found by a keen eye between the White Hawk football ground and the golf course. It seems that the hawk was created in late 2001. 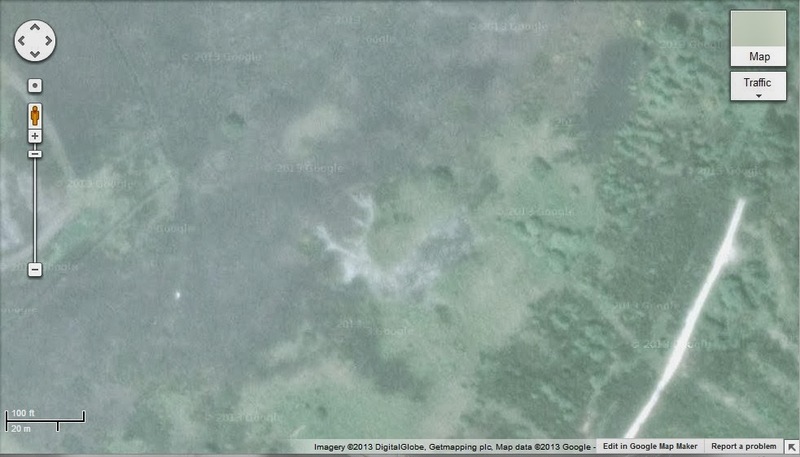 The fading Brighton White Hawk completes the list of the hill figures that I was able to locate using the power of Google Maps. It seems that Britain has been home to a large number of other hill figures over the years, however many seem to have been lost due to a lack of maintenance or via other destructive influences. If I find out about any more they will be posted here! 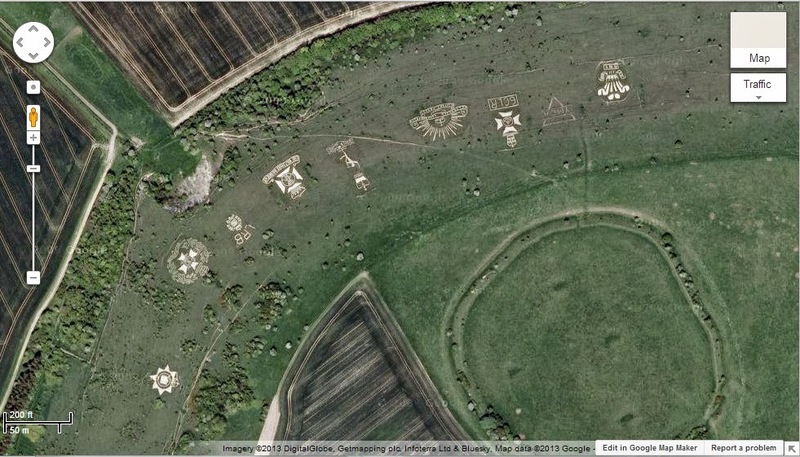 Pictures, Google Maps (September 2013).